What is IP Multicasting? -IP multicasting allows a host to send a single packet to thousands of hosts across a routed network i.e. The Internet. It is used mainly for audio (radio) and video distribution. Broadcast messages are not sent through routers but multicast messages are. 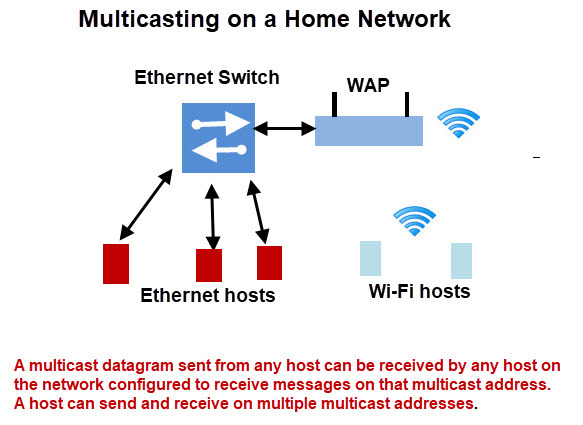 A host must be configured to receive multicast messages. The addresses range between 224.0.0.0 and 224.0.0.255 is reserved for use by routing and maintenance protocols inside a network. On a small home or office network any host can send and receive multicast datagrams. 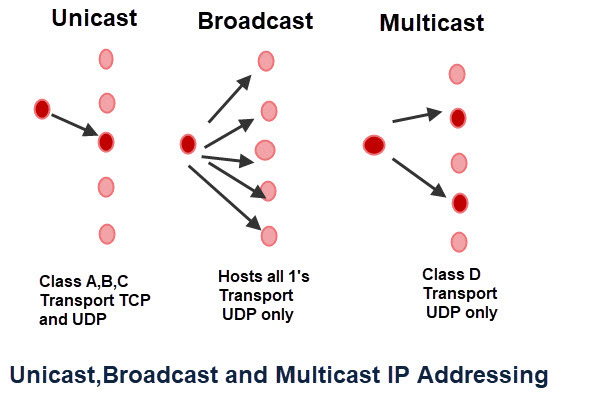 Note: multicast uses UDP and are sent through switches and hubs. To receive a multicast message a host must be configured to receive on that multicast address. All hosts that are configured to receive packets on a particular address are part of a multicast group. A host that is configured to receive datagrams sent to a multicast address becomes part of a multicast group for that address. A group can have 1 to an unlimited number of hosts. Neither hosts or routers maintain a list of individual group members. 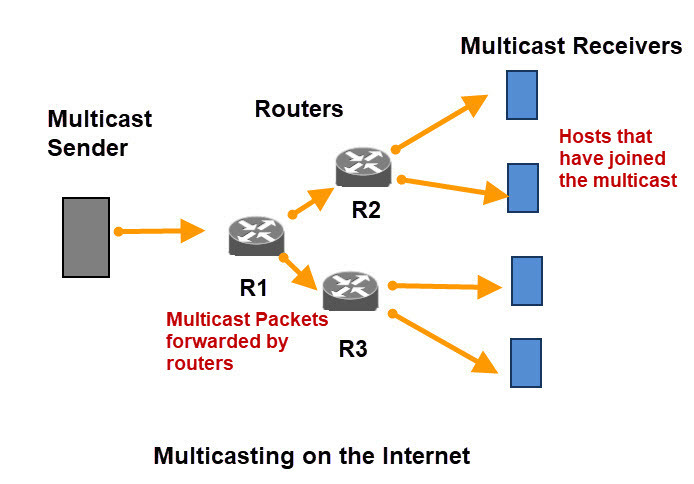 A host can be part of multiple multicast groups and can send to multiple multicast addresses. A host can send datagrams to a multicast group address even though there are no members of that group, and a host doesn’t need to be a member of a group to send multicast datagrams to that group. Note: Multicast packets are sent through switches. On the Internet multicast packets need to be forwarded by routers. A router will determine if any of the hosts on a locally attached network are configured to receive multicast datagrams using IGMP( Internet Group Management Protocol). Routers will listen for IGMP messages and periodically send queries on the local subnet. using the multicast group address 224.0.0.1 (Reserved All hosts address). Multicast routers do not keep track of which hosts are part of a group, but only need to know if any hosts on that subnet are part of a group. If a router receives a multicast datagram from another network and has no members for that group address on any of it’s subnets it drops the packet. On a typical home network there are a variety of protocols that use multicast. The SSDP (Simple Service Discovery Protocol) uses multicast address 239.255.255.250 on UDP port 1900. Here is a screen shot from running tcpdump on a raspberry pi. Pls help me.i have an iptv with my contents.how can i broadcast my contents to people around me to receive my contents signal and watch. I don’t want my receivers to use internet to watch my contents…..only the admin will use Internet to get the contents and broadcast.What equipment do i want ? Where can i buy this equipments. When I searched for details of ip address it turns out to be a multicast ip address. In this case, can an individual be trying to hack my email account. Is there any way to find who tried to hack ? You response will be of a great help. Many thanks in advance. Sorry but I can’t help as I’m not up to date with hacking attacks.